Looking to connect? There’s a wonderful HSV/HPV community full of support and friendship waiting for you. Just fill out the form below and someone will contact you as soon as possible to help you determine where you might best enter the community. Once you’re in, you can always expand those horizons at any time. You're not alone. Join the support community! We'll be contacting you via email. Please provide your address. City; state; province; whatever. It'll help us help you better. Don't be afraid. We have them, too. How can we help you? Any particular type of group you're interested in? 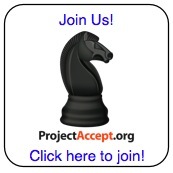 On which website or from whom did you learn about ProjectAccept.org? The HSV & HPV communities are H-only, private and discreet. By checking this box, you assert that you will maintain that standard: that you A) have either HSV or HPV and B) agree to keep the status of your fellow community members private and in complete confidence.